By popular demand, Autogeek carries the original polish for scratch-resistant clear coats! Note: Menzerna Super Finish Plus SF-3800 is the new and improved version of Super Finish SF-4500. In addition to improving the formula, Menzerna has changed the name and label. It is currently only available to select U.S. retailers. Menzerna Super Finish Plus is the first polish developed by Menzerna for the scratch-resistant, ceramic clear coats. The fine grade finishing polish removes 2500 grit sanding marks from the paint and eliminates compounding haze to leave the paint looking smooth and shiny. Menzerna Super Finish Plus is very hard to find in the U.S. but we have obtained a small quantity due to customer demand. Try it before it’s gone! Menzerna Super Finish Plus is one of Menzerna’s Professional Line car polishes formulated specifically for assembly line use. Mercedes Benz of Germany uses Menzerna polishes on their brand new vehicles to remove overspray and refine the newly cured paint finishes. 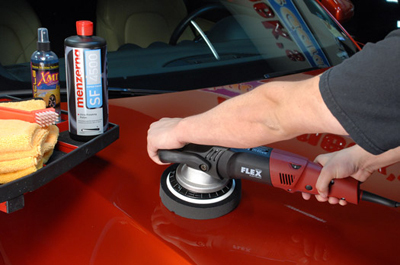 Now body shops and enthusiasts can use Menzerna Super Finish Plus to achieve a new car gloss! Menzera SF-3800, better known as SF-4500, is an ultra fine polish designed to provide a flawless finish on softer paint systems. Menzerna Super Finish Plus is body and paint shop safe. It contains no waxes, glazes, or silicones. Apply Menzerna Super Finish Plus with a dual action or rotary (circular) polisher for the best cutting power. For gloss enhancement, Menzerna Super Finish Plus can be applied by hand. Mist the Wolfgang German Polish N Wax Applicator with McKee's 37 Pad Conditioner to moisten the foam. Apply a nickel size amount of Menzerna Super Finish Plus to the applicator. Make sure the surface to be polished is clean and dry. Fresh paint should be fully cured. Apply Menzerna Super Finish Plus out of direct sunlight. Use a soft foam finishing pad, like Lake Country’s CCS Gray Finishing Pad or the White Ultrafine Polishing Pad by The Edge 2000. Apply a 6 inch line of compound to the vehicle. With the polisher turned off, spread the polish over about a 2 x 2 sq. ft. area. About Menzerna Polishing Compounds of GermanyJescar Finishing ProductsMenzerna Polishing Cream Metal Polish German Deep Gloss ComboGerman Final Gloss ComboMenzerna Ceramic Intro KitMenzerna Fast Gloss ComboMenzerna One-Step Polish 3-in-1 8 oz.Menzerna One-Step Polish 3-in-1 32 oz. Menzerna Super Heavy Cut Compound 300 8 oz.Menzerna Heavy Cut Compound 400 8 oz.Menzerna Medium Cut Polish 2400 32 oz.Menzerna Medium Cut Polish 2400 128 oz.Menzerna Super Finish (SF-3500) 8 oz.Menzerna Super Finish (SF-3500) 32 oz. Menzerna Super Finish (SF 3500) 128 oz. Menzerna Control CleanerMenzerna Super Heavy Cut Compound 300 32 oz.Menzerna Heavy Cut Compound 400 32 oz.Menzerna Heavy Cut Compound 1000 32 oz. Of course being a German made product menzerna is nothing short of AMAZING! No swirls no holograms no B.S. makes every car look brand new again with a simple one step polish followed by a sealant and wax! Used SF 3500 forever and finally gave this a go. Menzerna quality as usual. Removes compound haze, wash induced haze, very fine scratches but this is a very fine polish that I use just to get that extra little bit of gloss and clarity over the amazing 3500. Really a perfectionists polish when you want finish out as perfect as possible after a compound or jewel. Would highly recommend. ProsTop quality, perfect amount of working time. A little is all you need for perfection. Weekend warrior who used Zaino for past 8 years on 2009 black metallic Genesis until it ran out. SF-3800 really brought out the metallic flakes. In fact I stopped at a shopping center in the evening and could not believe the way the metallic flakes were sparkling in the parking lot lights. Maybe a few more swirl marks than i am used to but I will chalk that off to first time usage and probably using way too much product. Planning on doing a full paint correction with a ceramic coat in the spring and the SF-3800 is touted for working extremely well with ceramic coatings. Planning on using this to make the ceramic pop. Will update...but appreciate advice from those with far more skills and experience. ProsReally brought out metallic flake. ConsI only have an old Sears random orbit polisher and probably used too much product on first go round so it was a bit tough to buff off. Most probably me and my tools vs the product. Used for first time today, polishing couldn't be easier. New truck so didn't need much cut. The 3800 was perfect. Easy on, easy off.